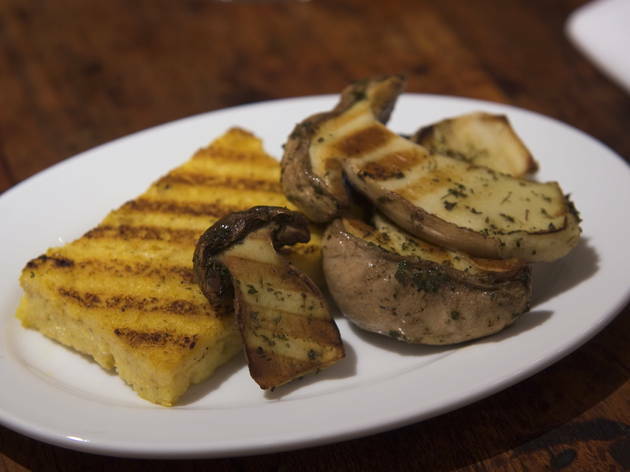 The buzz is as important as the food at this enduringly popular Soho restaurant, but the food can be pretty memorable too. The buzz is as important as the food at Jacob Kenedy and Victor Hugo’s enduringly popular Soho restaurant. Dine at the bar and you’re in for a fun night, or afternoon – especially if you’re by the window. It’s the perfect perch from which to watch favourite actresses swan into the clamorous and less atmospheric rear dining room. The menu is a slightly confusing mix of small and large plates to share and, amid the noise, it can be unclear what you think you’ve ordered and at what point it might arrive. Staff reassuringly affirm, ‘It’s sooo good,’ to virtually everything you suggest – and sometimes they’re right. We have fond memories of buttery brown shrimp on soft, silky white polenta (the Venetian preference), and a deep-fried mix of calamari, soft-shell crab and lemon. 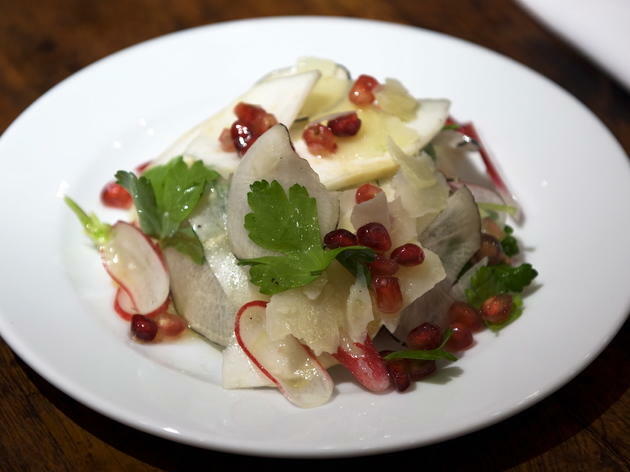 The radish, celeriac, pomegranate and pecorino salad with truffle dressing is a much-imitated Bocca di Lupo signature – far better, we found, than the spartan raw fennel salad. The brioche in our gelati dessert was also too dry to thrill, irrespective of the quality of the own-made ices. To drink, there’s an enticing selection of cocktails and an impressive all-Italian wine list, but it isn’t as fairly priced as the hype suggests. 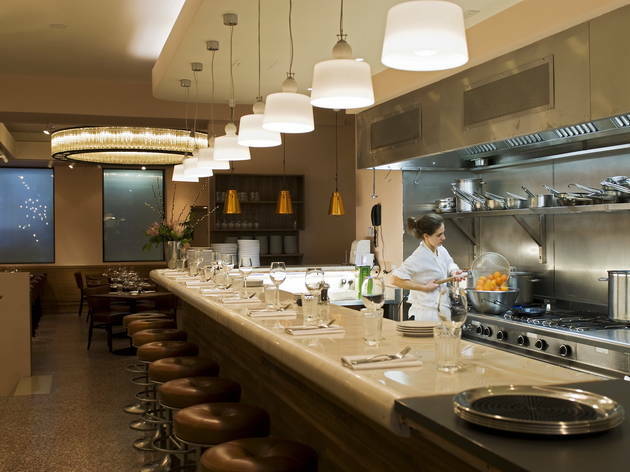 I don't usually go to Italian restaurants abroad, but I was intrigued by the look of this elegant restaurant in Central London, bustling and lively, with people sitting at the counter and busy chefs juggling between food preparations. Yes, sitting at the bar is quite cramped but watching such food magic happening in front of you is amazing. Food is delicious and I'm sure it doesn't need a proper introduction as we all know the wonders of Italian cuisine. I'd suggest you to order a few different dishes and try as many as you can. Vegetarian options are also available, for fussy eaters like me. An absolute gem in Central London. Weirdly enough, Italian food seems to be my preferred comfort food. Something about homemade, fresh pasta and sourdough pizza warms my heart (and my stomach!). I mean who doesn’t like a good, hearty bowl of pasta or a cheesy pizza, right? 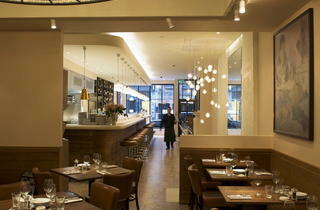 I’ve heard so much about Bocca di Lupo from friends and from reading Time Out London. It’s consistently recommended as a top Italian restaurant in London and even comes in near the top for the best restaurants in town. Having had to reschedule a meal with my friend last week, I thought this would be an apt place to catch up. I called a day before to make a booking and got seats at the ‘chef’s table’, which is essentially bar seating in front of their open kitchen. Admittedly, it is slightly cramped as many stools are placed close together but it’s a nice atmosphere being able to watch the chefs prepare your food in front of you. Upon arrival, I was immediately served a bread basket, which included 3 slices of herbed focaccia and 3 slices of sourdough bread. I asked for a bottle of sparkling water, as it was a really humid evening and I needed something to quench my thirst right away. Spider Crab & Samphire Bruschetta – A serving of this is only one slice so our waitress obviously recommended that we get two. To be honest, I’m a fan of anything with crab so this was pretty good! I liked that it was paired with a type of vegetable that I’ve not come across before but worked well together. It was a little bitter and crunchy, which contrasted well against the soft and tender crabmeat. I also liked that it was drizzled with olive oil to give the bread some added flavour and moisture. Buffalo Mozzarella, Tomatoes, Rocket & Basil – A classic Italian starter dish and perfect to share. The ball of mozzarella was huge! It was easy to split in two, as the knife cut through it smoothly. It was so soft and creamy, a lovely match with the fresh and juicy tomatoes, the fresh basil leaves and the rocket leaves for some bitterness. Trofie w/ Potato, Green Beans & Wild Garlic Pesto – Now this was some good comfort food! It reminds me of my childhood in Paris, where my mum would always make us pesto pasta at least once a week to eat with some chipolata sausages. I liked that this version was pretty traditional, where it was served with thinly sliced potatoes, green beans, and a homemade pesto sauce. The pasta was cooked al dente, as it should be and that was exactly what I wanted! The pesto sauce was very flavourful and I liked that I could still see chunks of pine nuts, adding some crunch and texture to the dish. Crab Linguine – This had to be the best pasta I’ve eaten in a long time! It was such a simply dish and really felt home-y. There was a good amount of crab chunks, large tomato pieces too, and just the right amount of fresh basil. Again, the pasta was cooked al dente, which made it even more authentic and delicious! I’d definitely come back to have this as a main dish! Chicken Scallopine w/ Marsala & Girolles – Chicken has never tasted so good! The slices of chicken were so tender and moist on their own but when paired with that lovely mushroom sauce on top, it was even more so! The sauce was really flavourful on its own and nice to dip the leftover bread into from the bread basket we were given at the beginning. An absolute treat dining here and I’ll definitely be back, whether that’s to eat on my own at the chef’s table, to introduce more friends to this place, or even to bring my family here when they’re in town! Thank you Bocca di Lupo for such a satisfying and much needed meal. It was only a Tuesday evening but I’d already had such a bad week with issues carrying forward from the previous week. We enjoyed our meal here - but thought most of the dishes we had were very average compared to other Italian restaurants in town. We preferred Trullo's wild boar ragu to Bocca's for example. 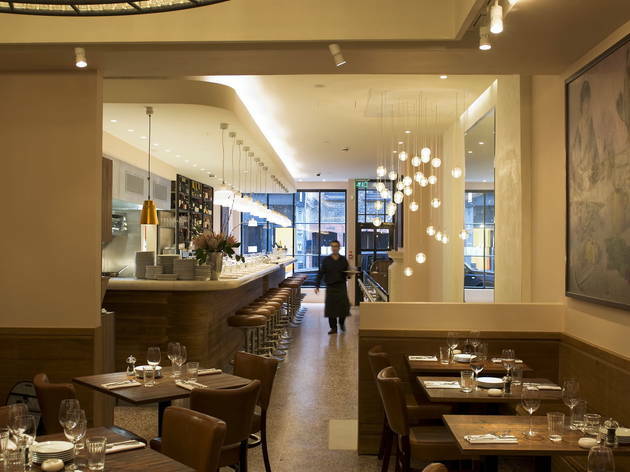 I'd always known about Bocca di Lupo, from walking past it a thousand times when I worked in Soho, but it was only recently that I tried it for the first time before going to the theatre to see a show. I must say it was one of the best meals we've ever had in London. We sat up at the bar, and it felt like a luxurious experience from start to finish. Every dish was extremely delicious, and the wine was equally so. 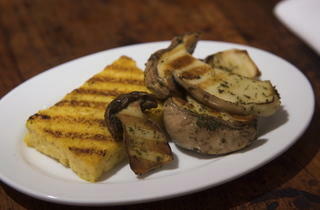 The menu is tapas style, but Italian, and the portions were generous! We'll definitely be back very soon. I returned to Bocca di Lupo after a couple of years (5 years to be exact) to celebrate my husband's birthday and it was as great as in my distant memory!! This time we were lucky to book a table for 2, but the bar is also a very nice experience, and to enjoy the buzzing atmosphere of this truly authentic Italian restaurant. The food is DELICIOUS! We indulged ourselves in the following Italian tapas: supli (a type of roman risotto fried balls), grilled langoustine, radicchio truffle salad, baked sea scallops, parma ham & figs.. We both had a dish of pasta for main course, Linguine with Clams and orrechiette with n'djua, Totally delicious, service is both friendly and professional. this is probably my favourite Italian restaurant in London. Booking highly recommended!! Had a fantastic lunch here a couple of weeks ago, celebrating my husband's birthday. I had heard so many good things about it and it definitely lived up to its expectations. 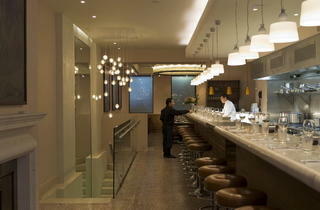 They have a menu compiled of dishes from different regions of Italy and delicious wine to gulp it down with. Orzotto with rabbit was hearty and delicious and our favorite of the dishes we tried, eating the tagliatelle with goat ragu felt we were back in Sardinia, the fried mozzarella balls were a pleasant surprise and lamb cooked in white wine was very succulent. Unfortunately we had no room left for dessert when we left, but Bocca di Lupo left us coming back for more. 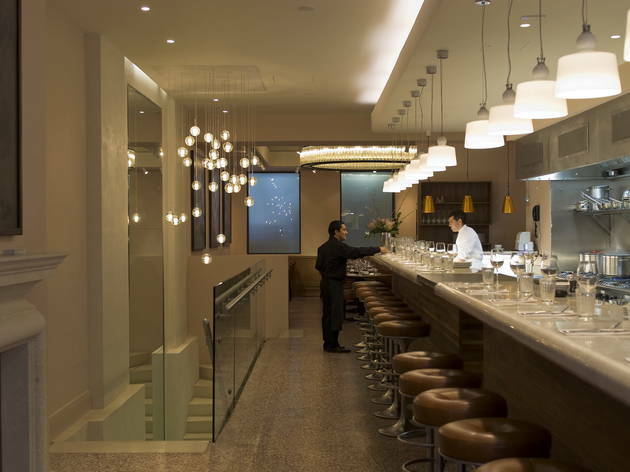 One of the very few places in London where you can get Barolo by the glass. The food is amazing. We managed to walk in and get a spot at the bar, it was relatively early in the evening and the place did fill up quickly. Ottimo cibo ma prezzi alti. Sui vini attenzione, chiedi una bottiglia di vino da 20 euro e te ne portano una che costa il doppio. Attenzione! Sono superficiali nel servizio in sala. 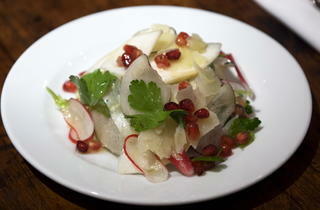 I was so taken by Bocca di Lupo the first time I went, that I had to back the following week. Good, authentic italian food made and served with care, everything here is delicious. Try to snap the spot right in front of the chefs in the bar for a little entertainment with your food, and go for the small portions instead of the large ones - they're made to let you try more of the menu, and share with the table. I strongly recommend getting the pork with grapes and chestnuts, but do bare in mind that even the small one is big enough for two. I really love this place, although it's not easy on the wallet. Try their gelato place across the street for dessert. I love this authentic Italian restaurant. The first time I went there I was fortunate enough to go with an Italian foodie who ordered us the most stunning food. A lovely touch is you can go across the road to their deli and choose your truffle which is then served with your food. Simply wonderful. You know somewhere is great when it's impossible to book a table. Small but perfectly formed Italian. Great, reliable restaurant. Never had a bad meal at Bocca di Lupo. The service is always fantastic. If you want a Friday night table book well in advance but for mid week it is generally ok to book a few days in advance. There is also a perfect private dining room for events. An absolute personal favourite and whenever taking someone there who has not been it always amazes. Such great food, great service. A real winner. Expensive. Small plates. Good if you're loaded and you don't care if you have to spend £100 on four slices of ham and a glass of wine. If not, you'll be underwhelmed. I love the fact that you can see them cooking in front of you, great Italian food, sort of like tapas! Think we got the last table last Sunday but sitting at the "Chefs counter" was really an experience. Not only were we served fantastic food, one dish more voluptuous than the other. Oh, did I mention absolutely wicked cocktails to start with. We were also served something of a show from the kitchen. I don't think I have ever heard that many "Yes, chefs!" before, not even on Gordon Ramsey's programs. Service was excellent, we could have made a "this is the way you should treat your costumers" video that evening as EVERYBODY in the staff did a great job in making us feel pampered and well looked after. We did end the evening a cross the street at Gelupo where they were also very friendly but the Gelato was a bit too main stream. Never the less, we had a great evening and can really recommend an evening at Bocca di lupo. We did have a full evening dinner with cocktails and several courses plus a great bottle of wine and the bill was quite reasonable. Sat at the bar on Saturday afternoon and it was fantastic. Staff friendly, attentive & helpful and the food was simply wonderful. The scallops in butter and thyme + Sheeps Ricotta Tortellini with walnut pesto were my favourites. Can't wait to go back Can't wait to go back. I have to admit the food was spectacular. However, a very average level of service from staff and horrendously rude attitude from the maitre d... ruined an otherwise lovely evening. Not sure I'd bother going back, as plenty of other places in London where the service matches up to the quality of the food. simply the BEST italian in town! I've dropped in twice in the past two months (the last being yesterday) without reservations; the trick is to go very early or quite late. Staff are very courteous and attentive, but a waiter was so aggressive (in an oddly polite way) with pushing the drinks! Bocca, this makes you look desperate and into fleecing customers, please stop him. Food is fantastic, and the fresh menus make it fun to come back. Salads are fresh, flavourful and piled high; pastas are definitely home-made. They triumph at pillowy gnudi in ragout, their pumpkin tortelloni generously buttered and scattered w rustic breadcrumbs. This place makes Italian food really sparkle, and while The prices tend to the ritzier side, it's important that I as a customer felt that it was so worth it. I can't believe the review by "Pau"l below - can only imagine it's a rival restaurant trying to destroy a reputation. Bocca di Lupo is bloody marvellous. Accusations of tinned or somehow not fresh food served are ludicrous. Everything I've ever eaten there has been spectacular. Go! Totally agree with TO review. Great staff, fantastic food, buzzing atmosphere. The crab linguine was delicious, and the guy next to me was raving about his courgette flowers. We turned up at door and just had to wait 20 mins for a seat at the bar (the best place to sit). Loved watching the kitchen in action. Ignore all the moaners below – I'm with Frank! this is a great place to eat and I've recommended it to loads of people.